Have you ever thought about creating a blog? In addition to writing articles on topics related to your industry, you are creating a web community with your customers, which is an interesting addition to your website. Your content can be original, interesting and well written, but if it's never being read, what's the point of spending time creating it? Search engine robots go through several aspects of your blog articles to come to a conclusion: is this article relevant or not? The more relevant it is, the higher it will be on the results page of these search engines. Here are 6 tips to improve the SEO of your blog. Keywords can make a huge impact for the SEO of your web. It is important to add several keywords, while staying harmonious.. Robots do not like articles that are just a succession of keywords, and neither do your readers! Write your texts naturally, making sure to add the most important ones without being too repetitive. Tool: There are some tools to help you find which keywords will work best for your audience like Google Trends. It allows you to see the evolution of certain words or phrases and their relevance based on characteristics such as geographical location, language, etc. Your article title is not to be neglected! Why? Simply because with a catchy title, the percentage of people who will continue reading will be much higher. In order to hook your readers into the reading the whole thing, your title should be relevant with the rest of your text. Do not hesitate to add your keywords: your articles will have a better chance to find themselves high in the search results. Adding a social media bar like the one below on your blog will encourage people to share your articles. Then, their social media connections can read them, share, and so on. To add it on your WebSelf website, you will need to do so in script in the editor using a website that offers that kind of service, just like Add This. Inbound and outbound links to your site are important, as we've explained in this blog article. Not only do they help you in the SEO of your website, but it easily redirects people to other pages on your site that might interest them. 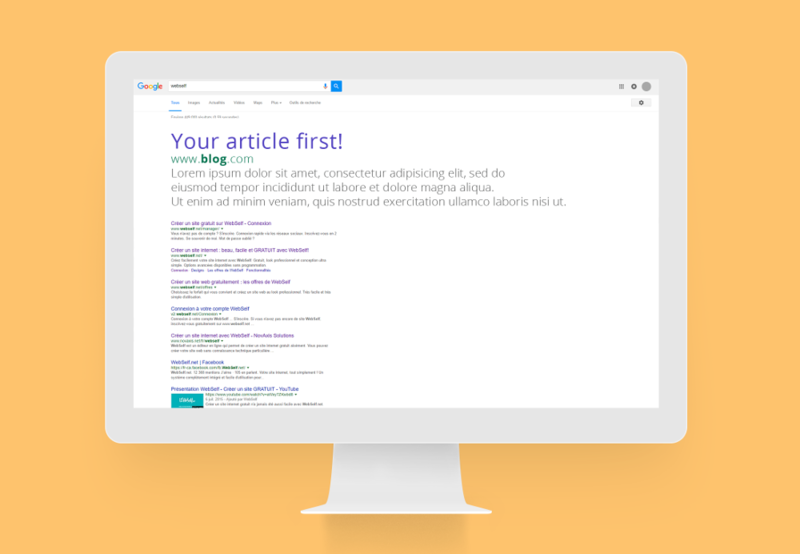 For your blog, it's the same: add links to other articles or even to pages of your website. Tip: Be sure to embed links that will open in new tabs, not to make people permanently leave the article they are reading. The more interaction between you and your readers, the more the notoriety of your blog is increased, so you guessed it, so does the SEO. Do not hesitate to ask questions at the end of your articles, or to encourage people to leave a comment or share your articles on their social networks. Get your community involved by participating in different and creative ways. Your article must be accessible, regardless of the device used by the reader. Whether it's a tablet, a computer, a smartphone, they should be able to find your article by typing the keywords and the title on the search engines. 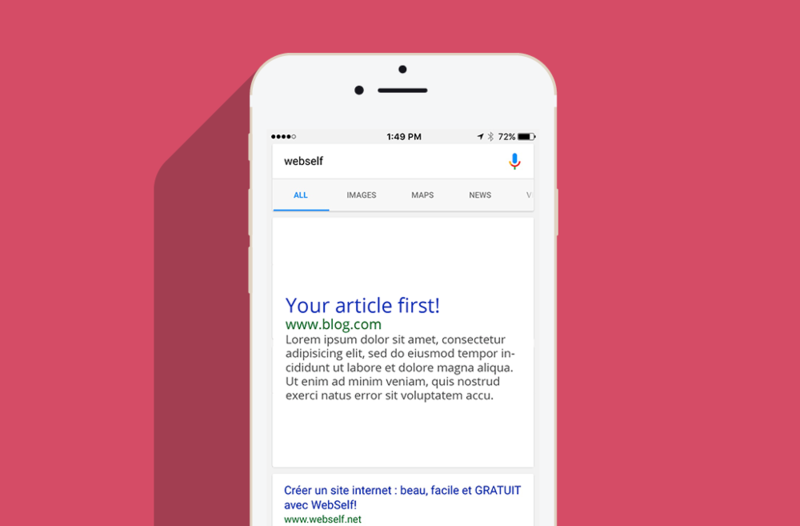 Luckily, with a WebSelf blog, your article will automatically be accessible from a mobile device. In the editor, you will find at the top right, an icon of a smartphone, where you can have a preview of what your website will look like on a smaller device. You can make changes if you wish. Choose a blog title that is a succession of keywords. Search engines will penalize you. Repeat a keyword too many times in your texts. Buy links. This will not help you at all! Publish only images. Search engines reference the text more easily. With that being said, nice pictures added to your texts are very strongly suggested!